Thee Sunday Sonics was initially put together in 2015 as a free entry event within the Fat Tuesday weekend by artist and musician Danny Pockets, working in collaboration with a range of artists, musicians and filmmakers. Danny’s creative drive, charm, restless imagination and determination succeeded in bringing the rich, underground seam of experimental music and art within the town out into the open for all to experience. 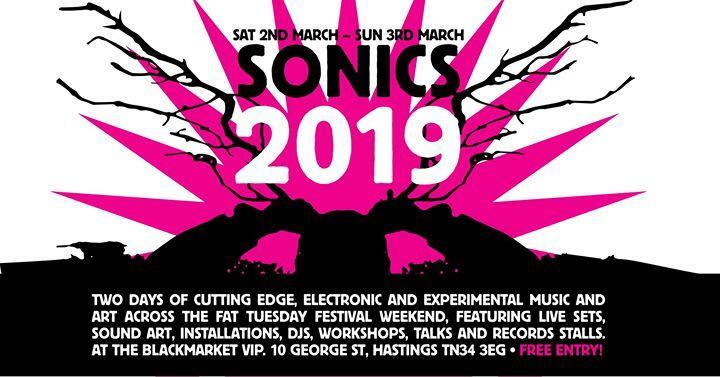 After three fantastic, free entry Sunday events held in the Printworks Hastings, Thee Sunday Sonics has this year been expanded over two days, Thee Saturday Sonics 19 and a special live event on the Sunday with Radiophonics Workshop, supported by Vile Electrodes. The Saturday event will remain a free entry event and the daytime session will include sound art, installations, DJs, workshops, talks and records stalls in a welcoming, fun and relaxed space. Somewhere people of all ages will be able to visit and hang out while they discover, interact with and experience cutting edge, electronic, experimental music and art. This year the line-up includes a number of influential figures in the world of underground and electronic music…..
Visit – www.hastingsfattuesday.co.uk for more artist information and links. Line up and timings may be subject to change.